We use these three boars on pure bred Tamworth, Berkshire, Hampshire, AGH, Gloucester Old Spot, Duroc, Hereford, mangalitsa, and large whites. The hybrid vigor makes our animals hardier and more resilient. The natural instinct in these animals and the form of husbandry we use allows a real life for our pigs. 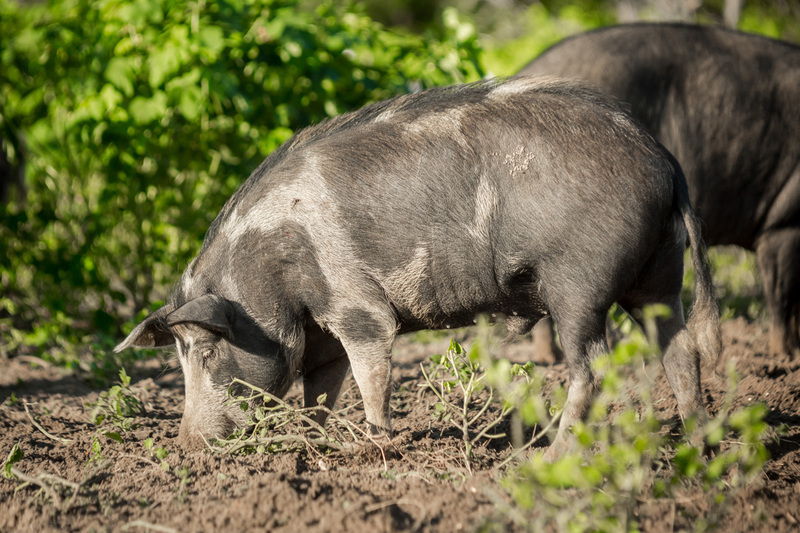 Rooting, frolicking, and running uninhibited through woods and pastures allows pigs to be pigs. This is how Mother Nature intended, not on concrete not in a cage! Our second herd of hogs reside in Ravenel SC at Rebellion farm, here we just raise our pure bred Non hybridized Ossabaw Island herd. Leon “Mohog” Jackson is our boar hog and we utilize 16 sows to produce the jewel of the South, Ossabaw Island Pork. One of the greatest treasures the South can ever claim! Rebellion farm is an educational workplace for young and aspiring farmers. Owned by the Allen family Rebellion Farm is located about 15 minutes from downtown Charleston perfect for field trips when traveling to the Holy City. A big thanks to Jeff Allen for all his behind the scenes help since my wife and I started on this journey. We raise a farm cross that we have been working on since our farm inception. The Sowega King is a large bodied meat hog that we created to blend many different qualities we loved about certain pure bred lines. We have utilized many different heritage breeds to create the Sowega King and are from finished! We aren’t trying to say we have a new stabilized breed by any means as there many different color patterns and variances but what we are striving for is the quality of meat and the structural frame of our hogs. Large shoulders and hams with long bodies and rounded backs give the Sowega King its title. The greatest attribute is the intramuscular fat and the complexity of fat though. We believe the Sowega King rules all other meat hogs! Berkshire-Duroc-Mangalitsa-Tamworth-AGH – Mulefoot – red wattle – Hereford – Meishan- and Hampshire are all mixed in to comprise the Sowega King line. It’s truly a Royal Pig! amaze them with its exceptional taste and flavor! We sell breeders, feeders, and carcasses.